Beads, ceramic button, perforated paper, needles, floss, chart and instructions. GBFRM3 Matte Green; Mill Hill; Frames - Mill Hill; Solid Color Wooden Frames; Front opening 5.5" x 5.5"
Christmas Village Series; Mill Hill; Buttons and Bead Kits; Winter Series; Beads, ceramic button, perforated paper, needles, floss, chart and instructions. Mill Hill frame GBFRM3 sold separately ; 5" x 5"
Christmas Village Series; Mill Hill; Buttons and Bead Kits; Winter Series; Beads,ceramic button, perforated paper, floss, needles, chart and instructions. Mill Hill frame GBFRM2 sold separately ; 5.25" X 5.25"
Mill Hill frame GBFRM12 sold separately ; 5" X 5"
; Mill Hill; Buttons and Bead Kits; Winter Holiday Series; Beads,ceramic button, perforated paper, floss, needles, chart and instructions. 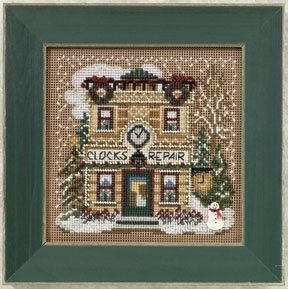 Mill Hill frame GBFRM3 sold separately ; 5.25" x 5.25"
Christmas Village Series; Mill Hill; Buttons and Bead Kits; Winter Series; Beads, ceramic buttons, perforated paper, needles, floss, chart and instructions. Christmas Village Series; Mill Hill; Buttons and Bead Kits; Winter Series; Beads, ceramic buttons,perforated paper, needles, floss, chart and instructions. Christmas Village Series; Mill Hill; Buttons and Bead Kits; Winter Series; Beads, ceramic buttons,perforated paper, needles, floss, chart and instructions. Mill Hill frame GBFRM3 sold separately ; 5" x 5"
Christmas Village Series; Mill Hill; Buttons and Bead Kits; Winter Series; Beads, ceramic buttons, perforated paper, needles, floss, chart and instructions. Mill Hill frame GBFRM3 sold separately ; 5" x 5"